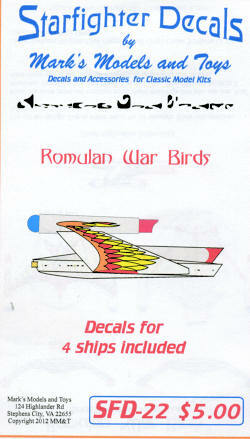 This sheet from Starfighter Decals is pretty much aimed at the board wargame fans. The sheet is for the Romular Warbird and there are two identical sheets in this one. There are full markings for two warbirds in two different scales. 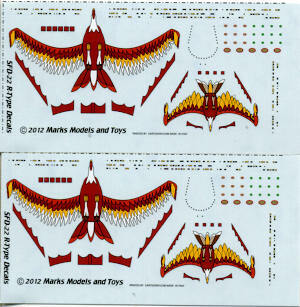 In addition to the large bird markings there are trim colors for the rear of the upper section as well as a number of photon torpedo tube markings, phaser markings and impulse engine markings. Enough to make your warbird properly busy. Thanks to www.starfighter-decals.com for the review sample. You can buy these direct if your local shop does not carry them.